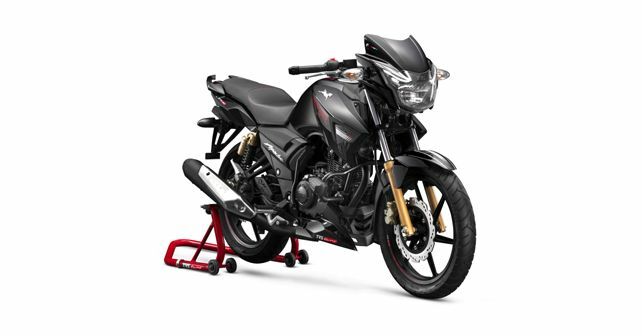 On the MY19 Apache RTR 180, most notable changes include refreshed sports livery and a new digital instrument cluster. TVS Motor Company, as part of its celebration of crossing the sales milestone of three million units, has introduced the MY19 Apache RTR 180. The RTR 180 had been last updated around six months back when TVS had introduced its Race Edition. For 2019, the RTR 180 has only been given a few feature updates and additions. Mechanically, the bike remains unchanged. The old, blue back-lit speedometer has been replaced with a new, white back-lit speedometer with dial-art. The single-piece seat now comes with an Alcantara-like material finish and the race-inspired livery has also been updated. The updated bike also features a new crash guard with integrated frame sliders and forged end-weights on the handlebar for an added premium touch. The bike continues to be powered by a 177.4cc air-cooled single-cylinder engine which produces 16.3bhp and 15.5Nm of torque, with a top speed of 114km/h. The updated version of the RTR 180 will be available in five exterior colour options - Pearl White, Gloss Black, T Grey, Matte Blue and Matte Red. Available in both ABS and non-ABS versions, the updated Apache RTR 180 has been priced at ₹ 84,578 for the latter and ₹ 95,392 for the ABS version. Prices are Ex-showroom, New Delhi.